The counseling for admission into 1st semester B.Tech. Courses in the Govt. 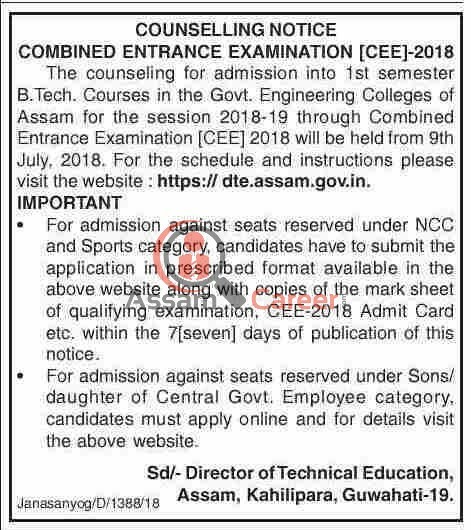 Engineering Colleges of Assam for the session 2018-19 through Combined Entrance Examination [CEE] 2018 will be held from 9th July, 2018. For the schedule and instructions please visit the website : https:// dte.assam.gov.in. • For admission against seats reserved under NCC and Sports category, candidates have to submit the application in prescribed format available in the above website along with copies of the mark sheet of qualifying examination, CEE-2018 Admit Card etc. within the 7 [seven] days of publication of this notice. • For admission against seats reserved under Sons/ daughter of Central Govt. Employee category, candidates must apply online and for details visit the above website.